Did I say plastic cheese? I meant cheese plastic, that is, plastic made from the cheese protein casein. Casein comes from the Latin word caseus, which means ‘cheese’, and it’s a protein found in mammalian milk. It makes up 80% of the protein content of cow’s milk, and 20-45% of the protein in human milk. And because it makes up most of the solid curds you get when a coagulant is introduced to acidified milk, it’s a pretty big part of cheese. Which is pretty awesome, but not everyone wants to rush out and make their own cheese. Fortunately, casein also has some other uses that are easy to copy in your own home. As the video below demonstrates, you can separate milk into fat and protein curds and whey by adding vinegar. And when the protein is separated and dried, it sets very hard, making it a simple DIY plastic. This casein plastic was common before the widespread use of petroleum-based plastics. A particular brand called Galalith, from the Greek for milk and stone, was used to make buttons. Casein was also used to make billiard balls and other hard moulded objects. But its usefulness doesn’t stop there; a number of fibres have been produced by extruding the protein. These can then be made into clothing, and it is still being used for this purpose today. It’s also used in dentistry for repairing teeth, in certain paints and in glue for specific applications, such as when its heat resistance is required (you can also make casein glue at home, by neutralising the acid before it hardens). Structurally, the protein is very similar to gluten, so some people have allergic reactions to it, and must avoid it in their diet. Recently it has been suggested as a trigger for autism in children, but so far no evidence supports this hypothesis (Millward C, Ferriter M, Calver SJ & Connell-Jones GG, “Gluten- and casein-free diets for autistic spectrum disorder”, Cochrane Database of Systematic Reviews 2008, Issue 2. Art. No. : CD003498. DOI: 10.1002/14651858.CD003498.pub3). We’ve pretty much milked this topic for all its worth… But here’s one more video on casein. Well, close enough. The ABC TV mini-series Devil’s Dust gave an enlightening but frightening history of asbestos-related disease and litigation in Australia, and it made me want to find out more about this wonder material turned bad. What exactly is asbestos, and how does it cause cancer? 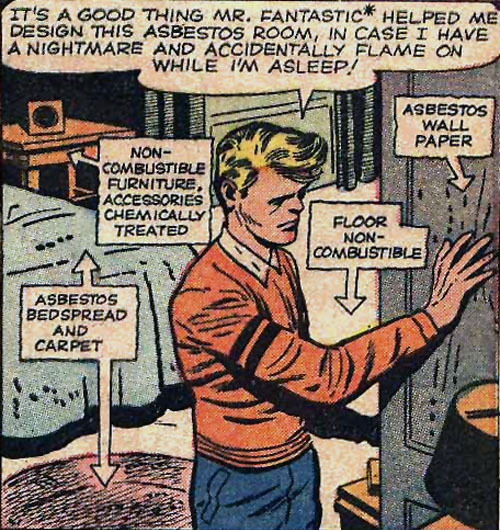 Asbestos is a family of fibrous minerals. The most common type mined in Australia, primarily at Wittenoom WA, was blue asbestos, or crocidolite. Its chemical formula is Na2Fe2+3Fe3+2Si8O22(OH)2, which is actually that of an igneous mineral called riebeckite. Riebeckite forms elongated blue crystals, but it’s only considered asbestos when the crystals are fibres with a width of about 1 micrometre or less. There are five other types of asbestos, mostly minerals with tiny rigid fibres like crocidolite. However, there’s one kind, known as white asbestos or chrysotile, mined primarily in Canada, which has longer, softer fibres. All kinds of asbestos are resistant to fire, heat and chemical damage, and have been used in various forms for thousands of years. However, it’s probably the flexible white asbestos, chrysotile, which was woven into miraculous cloths that could be cleaned simply by throwing them into the fire. Wily traders tried to convince people these cloths came from the fur of the fireproof salamander, but Marco Polo himself debunked the idea, calling it “fabulous nonsense”. In Australia, the less flexible blue asbestos was used for decades as a component in building material and insulation, thanks to its good tensile strength. But there have been other uses that seem absolutely crazy in hindsight, such as making filters for cigarettes and gas masks, or even artificial snow. However, health problems due to over-exposure have been known for hundreds of years, with mentions of lung disease afflicting slaves who worked in asbestos mines. Quite possibly this was asbestosis, which is scarring of the lungs caused by an accumulation of inhaled fibres. Even scarier though is mesothelioma, a cancer of the mesothelium, or protective lining around organs – primarily the pleura, which lines the lungs. How asbestos causes cancer – or even how it gets out of the lungs and into the pleura – is not exactly known. There are theories that it causes inflammation, or oxidative stress due to the undigestibility of the fibres, or that it interferes with signalling mechanisms, or even that the fibres get physically tangled and interfere with chromosomes in the cell (Toyokuni S 2009, “Mechanisms of asbestos-induced carcinogenesis”, Nagoya Journal of Medical Science, vol. 7, no. 1, pp. 1-10). This is because one notable property of asbestos fibres is that, even though they start at a scale of around 1 micrometre, they easily break up into into thinner fibres, getting down to 0.01 micrometres, or 10 nanometres. That’s smaller than the pores in cell nuclei. Whatever the mechanism, it seems that it can only take one rogue asbestos fibre to give you cancer. So should you panic? Well, although there are about 600 new cases of mesothelioma diagnosed in Australia every year (based on 2007 data), that doesn’t necessarily reflect the ubiquity of asbestos in the community. Some people contract mesothelioma after minimal exposure, such as washing clothes or being near a building site, but some workers in asbestos plants don’t get the disease. It’s possible that most of the fibres are removed by the human body before they’re able to do lasting damage. That doesn’t mean you should be too complacent, as mesothelioma can take between 20 and 50 years to develop following exposure. But neither should you panic: when the dangers were first realised, there was a rush to remove asbestos from buildings, but this only led to more fibres being released into the air. So now the recommendation is that, if the asbestos is intact, it’s safer to leave it where it is. But if you are doing renovations and need to remove it, it’s important to follow appropriate safety precautions, or hire a qualified contractor. You can find information about safe removal of asbestos at Asbestoswise, www.asbestoswise.com.au. Asbestoswise also recommend not panicking if you accidentally disturb and break some asbestos. Their advice is to wipe up the dust with a damp cloth or paper towel, put the cloth or towel into a plastic bag, tie the plastic bag and put it into another plastic bag, tie up that one and put it in your rubbish bin. Seal any cracks in the panel, or if it’s too damaged, replace the whole thing. So asbestos is very scary, but you don’t need to panic – just treat it with caution. You can find out more about mesothelioma from the Cancer Council Victoria. You might think that science lacks the raw power of interpretive dance, but worry no more. Dance Your PhD is a yearly competition where scientists get to try a style of communication that’s a bit more active than peer-reviewed journals. This year’s winner is Peter Liddicoat from the University of Sydney, who explained his PhD thesis on the nanostructure of aluminium alloys by using a circus strongman, a unicyclist, jugglers and clowns. Now known as Dr Liddicoat, Peter won $1000 and a trip to Belgium for a screening of his dance at TEDxBrussels. On our show that aired on 22 November 2012, Beth spoke to Dr Liddicoat about his research and his dance – you can listen to that interview on our podcast. Everybody likes custard, but who likes lumpy – or even chunky – custard? Today I’m presenting 4 simple techniques to keep the chunks out of your custard. Before we start, I should clarify that by custard I mean the real deal: made with milk or cream, sweetened with sugar and thickened by either whole eggs or just the yolks. This is not to disrespect the stuff you make using custard powder, which can be quite yummy and fascinating in its own right, being a non-Newtonian fluid that gets more viscous when you apply more pressure. But let’s be honest: real custard, or crème anglaise if you will, is a much better companion for plum pudding, and you can’t make ice cream out of custard powder. Like I said, it’s thickened with eggs, but it’s very easy to go too far and end up with lots of lumpy, grainy curds. For this reason many people are intimidated and won’t go near it, despite the culinary temptations. But you can remove some of the mystery using science; and my main reference is as usual Harold McGee’s book On Food and Cooking, an invaluable resource for any kitchen. Alright, we’ll get the primary but least interesting technique out of the way early: method 1 you will see in just about every recipe: strain out the lumps. That may sound obvious, and if so, good on you. What you’ll find with most of the other methods is that you’ll reduce the lumps, but there’ll often still be a few. So it’s safest just to strain them. Okay, method 2 is a bit more scientific: use a thermometer. Here’s where we need to understand how eggs work. Eggs of course are wonderful devices, designed to protect and nourish baby chickens. If you take a 55g egg, most of it, about 41g, is water. There’s 6g of fat, only 0.6g of carbohydrate, 213mg of cholesterol, and what we’re interested in, 6.6g of protein. There are many different kinds of protein in both the yolk and the white, all designed to do different jobs: obviously, they provide food for the chick, but they also protect against infection, prevent them from being nutritious for predators – laboratory animals fed on raw egg actually lose weight – and physically protect the embryo. The proteins – and remember proteins are long chains of amino acids all joined together – are folded up tightly into little knots floating in the liquid. This is why the white starts off transparent. But when you heat the egg, the proteins jostle around and break the bonds that fold them so tightly together – we say they denature, or lose their natural form. They unfold into long chains which then bump into and bond to each other, forming a network or messy web of protein throughout the material. This is when the egg sets or coagulates, becoming solid and opaque.These proteins are actually joined together using disulfide bonds, that is, involving bonds between sulphur atoms. So you can add certain chemicals like sodium borohydride (NaBH4) which break those bonds and can “uncook” the egg. Anyway, the different proteins coagulate at different temperatures, but overall a whole egg, that’s yolk and white combined, sets at about 73°C. But in custard it’s diluted – a basic recipe is one whole egg to 1 cup of milk and 1 tbsp sugar – so it thickens at a higher temperature, about 78-80°C. You get the lumps when you overheat it: then the proteins bind too tightly together, forcing out the water from their little networks and becoming hard little lumps. That happens at only another 5 or so degrees, so you need to watch the temperature very closely. Try to keep it below 85°C. Method 3 is actually the most reliable: add flour or cornflour, or even cocoa. The starch granules absorb water and also dissolve a bit, all getting in the way of the proteins bonding. You can even bring the temperature up to the boil, in fact, as McGee says, if you want a thick, stiff custard like crème pâtissière you must boil it, because the egg yolks contain an enzyme called amylase that digests starch and will make it all runny again unless you kill the amylase first by boiling it. So there you go. Making custard is just like doing a chemistry experiment: understand the basic science, use the right ingredients, and watch the conditions. Wait, what about method 4? That’s easy: practice, practice and practice, and get really good at it. Sounds facetious, but after enough times heating it slowly – like by using a double boiler – and using a kitchen thermometer to keep it just a bit over 80°C, you’ll get used to how it thickens, becomes glossy, and coats the back of a wooden spoon, as the professionals say. Really, the art of cooking is just science with practice. Carbon has been known to humankind since before recorded history, so it’s not surprising that discovering a new form of it – especially a form as remarkable as graphene, the wonder material of the 21st century – nets one a Nobel Prize. What is surprising is that it was discovered using everyday office supplies. Apart from the fact that there are more known compounds containing carbon than all the other elements combined (except for hydrogen of course, but we won’t mention that) pure carbon itself comes in many forms. 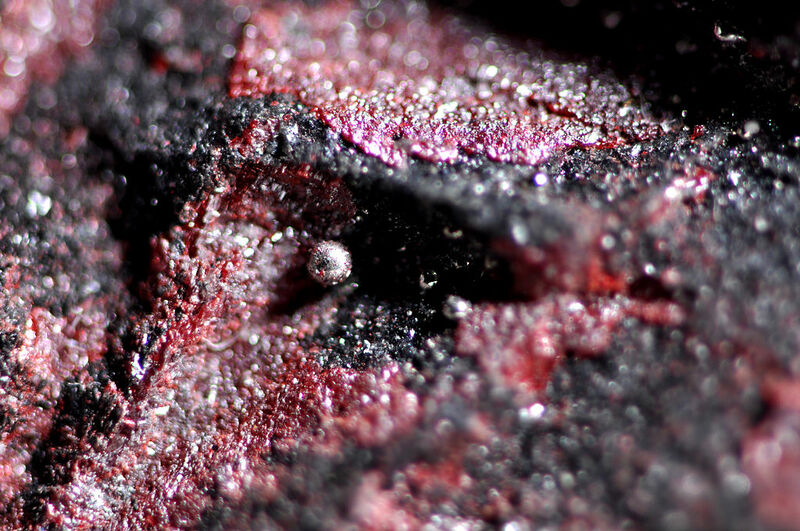 There’s non-crystalline amorphous carbon, found in coal and charcoal and soot and such. And of course if you subject it to high temperatures and pressures, like in Superman’s fist, it forms the crystals we call diamonds. Then there are the more complicated structures. The year 1985 saw the arrival of buckyballs, or to give them their proper name, buckminsterfullerene (named after Richard Buckminster Fuller, inventor of the geodesic dome), which are spherical molecules of 60 carbon atoms arranged in the shape of a soccer ball. But the most recent and perhaps the most amazing form of carbon comes from one of the most common. Graphite is best known for being the raw material of pencil leads, but it has many other uses including being a dry lubricant. 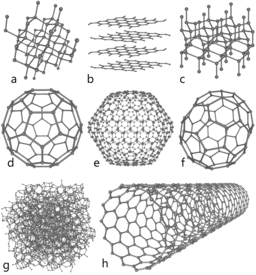 This is because it’s made out of millions of tiny flakes of 2-dimensional crystals with carbon atoms arranged in a hexagonal pattern (see allotrope b in the diagram above). These flat crystals can slip and slide against each other, or flake off to make marks on paper. Individually, these 2-dimensional crystals are called graphene. And of course, they’re not really new – we’ve known they exist for a long time – but it wasn’t until 2004 that anyone figured out how to extract graphene from graphite and do experiments on it. The secret is amazingly simple. 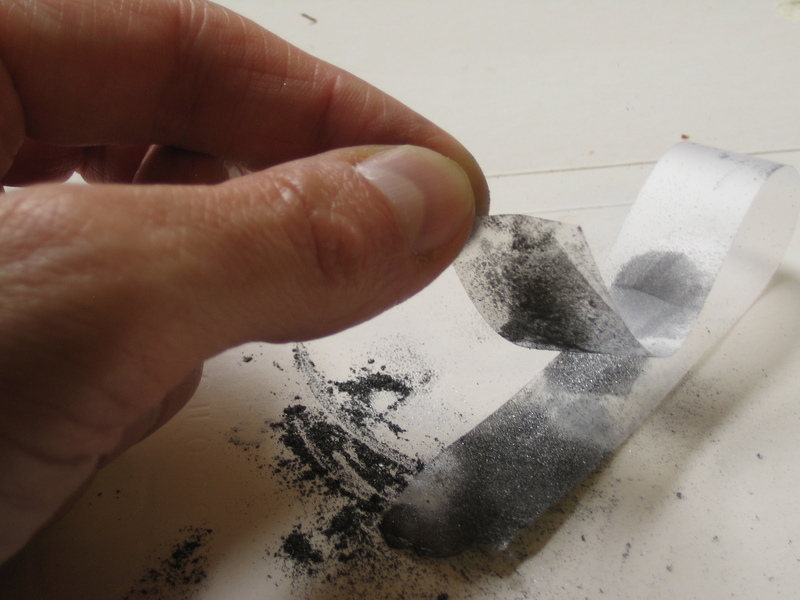 Starting with graphite extracted from, say, a HB pencil, it’s possible to peel off individual layers using common sticky tape. And because the tape is transparent, you can put it under a microscope and find the pieces of graphene crystal. It sounds nothing special, but because no one had thought of it before it won Andre Geim and Konstantin Novoselov the 2010 Nobel Prize in Physics. Clearly, it’s very thin: just one atom thin. Which means it’s nearly transparent, letting through 97.7% of visible light. And yet it’s practically impermeable. The carbon atoms in graphene are only 0.142 nanometres apart, so not even the smallest gas atoms (i.e., helium) can get through. It’s also incredibly strong, more than 100 times stronger than steel of the same thickness. It’s a great heat conductor, about 10 times better than copper. It’s easily turned into a better electrical conductor than copper. In fact, electrons move through graphene as if they had zero mass, a fact that was the subject of that episode of The Big Bang Theory where Sheldon Cooper had to get a job at the Cheesecake Factory so that he could figure out why. Being both transparent and such a good conductor, graphene has great potential for use in the next generation of touch screens – that would be strong, flexible touch screens – as well as in lighting panels and solar cells. Newer, more sophisticated techniques are needed to make sheets large enough for industrial purposes – now up to 70 cm wide – but it’s amazing that it all started with two physicists mucking around with sticky tape. What does this mean? Are McDonald’s burgers made out of undigestible material, meaning you can eat as many as you want and not get fat? Or are they a miraculous, non-spoiling food source that could feed hungry millions in places without access to fresh produce or refrigeration? Well, J. Kenji López-Alt of the Burger Lab has found a more mundane yet scientific answer, by comparing spoilage of a McDonald’s Quarter Pounder with a homemade control burger using good, honest, all-natural ingredients. Both burgers ended up with pretty much the same lack of mould or visible rot. The main reason seems to be that the burgers in question are small enough to quickly dehydrate when left out on the kitchen bench. Together with the fact that the burger patties are essentially sterilised in the cooking process, they lack both starting mould spores and the environment in which to grow them. This was further verified by sealing a McDonald’s burger in a plastic bag, which caused it to grow mould just like that loaf of supermarket bread you’ve left for too long. For the proper study, with control burgers and everything, head on over to the Burger Lab at Serious Eats. The discovery of bacteria that can turn urine into rocket fuel has, unsurprisingly, gotten a lot of media attention in recent weeks. But despite the slight exaggeration – NASA has given up the idea of flying to Mars on wee power any time soon – it’s actually a key component in a mechanism essential to supporting life in the ocean. Nitrogen is an essential part of biology, making up substances like amino acids and DNA. However, despite the fact that it makes up 78% of the Earth’s atmosphere, its gaseous form, N2, is mostly inert and hard for plants and animals to use. As a result, we rely on a complex series of chemical reactions, known as the nitrogen cycle, in which N2 is “fixed” by bacteria or chemical processes into a form we can use; and then, when we’ve finished with it, either through waste or decomposition, it’s turned back into nitrogen gas. It’s this second part where the rocket fuel comes in: the nitrogen-containing waste product that comes from decomposition, or particularly, urine, is ammonium, NH4. In the deep oceans, where naturally there is no air, ammonium is turned back into N2 by a reaction called anaerobic ammonium oxidation, or anammox for short. In a letter recently published in the journal Nature, scientists from Radboud University Nijmegen in the Netherlands have described the chemical mechanism used by bacteria that perform this anammox reaction. And an important part of it involves the chemical hydrazine, N2H4. And hydrazine happens to be a very unstable compound used in rocket fuel. As I mentioned earlier, NASA has dismissed this as a way to travel to other planets using astronaut wee. But this is still a useful discovery, apart from the fact that it explains the production of 50% of the N2 released from the oceans. Being anaerobic (that is, not needing oxygen), this reaction is useful for treating human waste. And potentially it means we could create other useful biofuels from sewage treatment. Which might not quite be rocket fuel, but it’s nothing to piss on. There is a lot that can be said about homeopathy, particularly on a science blog like this one. And most of it is not very nice – but I’m going to say it anyway. To cover the basics, homeopathy was invented by Samuel Hahnemann in 1796, based on the “Law of Similars”, or the idea that “like cures like”. This essentially involves treating disease using substances that cause the same sort of symptoms – except that you dilute it as much as possible, because supposedly if high concentrations cause an illness, then low concentrations must cure it. Don’t get me started on claims that water has a memory, or that there’s some sort of magical quantum effect. Quantum mechanics may do very strange things that don’t make sense in our familiar macroscopic world, but physicists actually understand it very well. It’s not some magic word you can just use to bluff your way through anything. But the main point is that it simply doesn’t work: see the reviews from our old friends at the Cochrane Library (and yes, I’m aware of claims that science somehow doesn’t work on homeopathy; but this is a science blog, so I’m going to stick with it). And it’s not just the rather amusing scientific reasons listed above that make it unethical, but also the serious fact that people have died after only taking homeopathic remedies for otherwise treatable illnesses: a baby in NSW that died from severe eczema and a WA woman who died of colorectal cancer. It also follows a similar finding from the UK House of Commons Science and Technology Committee (PDF 1.6 MB). Unsurpisingly, homeopathy’s supporters are trying to fight this conclusion. The Aurum Project – “commitment to the health and wellbeing of children” – is recommending their followers write to the NHMRC to complain. Well, why not take their lead but do the opposite? Write to the NHMRC and tell them you support their goals. After all, the way that science works is that the truth eventually wins out – but it doesn’t hurt to help it along.